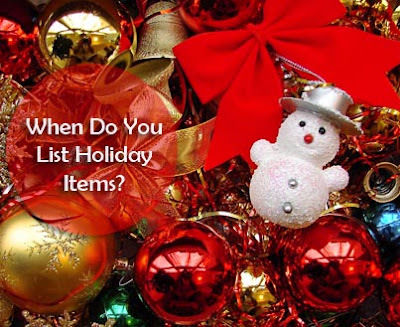 Listing Tips ~ When Should You Start Listing Holiday & Seasonal Items? We’re always either finishing up one holiday season or getting ready for the next. What do you do with your out of season designs and when should you start marketing them again? When you sell on an online marketplace, the price of your items, popularity off season, and cost to keep them listed should be considered. Off season sales for holiday items can be few and far between so tally up the fees and make sure that you can still turn a profit on those listings if you keep them active. If you decide to take them down make it as easy as possible to put the listings back up next year by copying and pasting the text into a Word document and keeping all your photos in a file. You may even want to print out your listing just for reference. Your venue may also allow you to download your listings in CSV format. You can open those files in Microsoft Excel. However you back up your listings before removing them until the next season, the idea is to make it as easy and quick as possible to put them up next year. Use keywords – When your items tie in with certain holidays, use the keywords Christmas, Valentine’s day, Easter, etc in your item titles, page titles, descriptions, image alternate text, and item URL’s if you can. It is these keywords along with descriptive keywords for the items themselves, ex: cards, socks, scarf, etc, that will allow people to find them on your site even when you are not focusing on marketing them. Do as the big guys do – If the next holiday is a ways away and you are not sure when you should start marketing those items, just look at the big retailers. When do you see your local stores setting up their displays? They usually do it prematurely but it does get people thinking about the next holiday so you may want to start advertising around the same time.